Contemporary sonic artworks often use field recordings from places of historic or social significance to address political issues. This article discusses relevant works for radio and fixed media by Peter Cusack, Jacob Kirkegaard, Eliška Cílková, Anna Friz and Public Studio, Stéphane Garin and Sylvestre Gobart, Ultra-red, and Matthew Herbert and outlines how they use both audio and visual/textual information to create awareness of the issues inscribed in these places, from current environmental concerns to the memory of genocide and displacement. Many theoretical accounts of sound art tend to treat it as a subcategory of either music or visual art. I argue that this dualism prevents many works of sound art from being fully appreciated. My subsequent attempt of finding a basis for a more comprehensive aesthetic of acoustic art forms is helped along by Trevor Wishart’s concept of ‘sonic art.’ I follow Wishart’s insight that the status of music was changed by the invention of sound recording and go on to argue that an even more important ontological consequence of recording was the new possibility of storing and manipulating any acoustic event. This media-historic condition, which I refer to as ‘recordability,’ spawned three distinct art forms with different degrees of abstraction – electroacoustic music in the tradition of Pierre Schaeffer, gallery-oriented sound art, and radiogenic Ars Acustica. Introducing Ars Acustica, or radio art, as a third term provides some perspective on the music/sound art binarism. A brief look at the history of radio art aims at substantiating my claim that all art forms based on recordable sounds can be fruitfully discussed by appreciating their joint material origins and multiplicity of reference systems rather than by subsuming one into another. This essay (in German) was written for a volume accompanying an exhibition at D21 Kunstraum Leipzig exploring the possibility of addressing social and political aspects of the contemporary cityscape through soundworks. It discusses works by Jacob Kirkegaard, Peter Cusack, Biosphere, Stéphane Garin/Sylvestre Gobart, Artificial Memory Trace, Mirt, Frans de Waard, and Zander/Fiebig in order to show different strategies for decontextualising and recoding sounds of specific sites. Der Aufsatz wurde geschrieben für den Sammelband „Verortungen/Entortungen. Urbane Klangräume“ zur gleichnamigen Ausstellung im D21 Kunstraum Leipzig. Mit welchen unterschiedlichen Strategien der Klang spezifischer Orte de- und rekontextualisiert werden kann, untersucht der Text an Arbeiten von Jacob Kirkegaard, Peter Cusack, Biosphere, Stéphane Garin/Sylvestre Gobart, Artificial Memory Trace, Mirt, Frans de Waard und Zander/Fiebig. This essay (in German) questions the frequent discussions of drone music in terms of cosmic, religious, or otherwise transcendental terms. Via Deleuze/Guattari and the theory of modernity as a process of (hyper-) acceleration proposed by sociologist Hartmut Rosa, the essay argues for a materialist aesthetic of drone music that uncovers its potential for resistance against the excesses of acceleration resulting in „post-democracy“ and widespread depression. Dieser Aufsatz hinterfragt die verbreitete Behandlung von Dronemusik in kosmischen, religiösen oder anderweitig transzendenten Kategorien. Mithilfe von Deleuze/Guattari und der Theorie des Soziologen Hartmut Rosa, der die Moderne als Prozess der (Hyper-) Beschleunigung begreift, argumentiert der Aufsatz für eine materialistische Ästhetik der Dronemusik, die deren Potenzial für einen Widerstand gegen jene Exzesse der Beschleunigung aufdeckt, die zu Phänomenen wie „Postdemokratie“ und der Zunahme depressiver Erkrankungen führen. 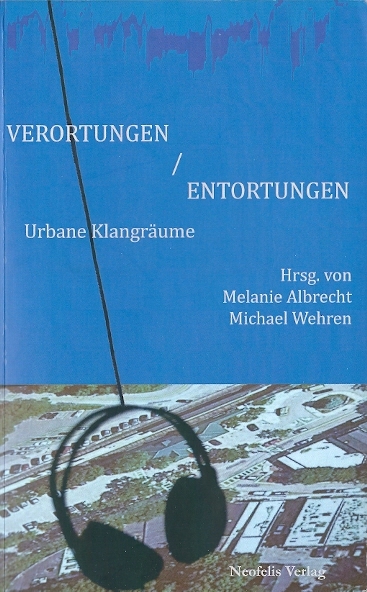 My contribution (in German) to this volume „on reactionary tendencies in the arts“ makes a case for discussing sound art in the context of media art and conceptual art rather than as a special case of either music or visual art. Taking valuable cues from Seth Kim-Cohen’s book In the Blink of an Ear, the essay shows that what passes as a ‚theory‘ of sound art in Germany often tends to shroud the works in esotericism instead of elucidating them. Artists discussed include Christina Kubisch, Rolf Julius, and Carsten Nicolai.